I often get questions about managing audiobooks with iTunes, and this week I look at two of them. One is about replacing artwork on audiobooks downloaded from Audible, and the other looks at the new way iTunes 12 organizes audiobooks. I also talk about upgrading old iTunes Store music files, and finding all the tracks that iTunes says are not found. 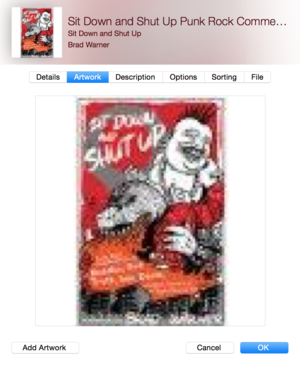 The image above shows an audiobook with Audible’s low-quality artwork. Below, I’ve added artwork using the Add Artwork button. Q: I buy audiobooks from Audible, and for some reason, the artwork in many of their books is horrible quality. I can’t delete it or change it, though, like I can with music or videos. Is there any way to do this? I, too, am surprised by the quality of artwork in many of the Audible audiobooks. It looks as though they use very small images, and when you look at them in iTunes, they are blown up and fuzzy. They don’t look too bad on an iPhone, but they are clearly not the same quality as, say, the artwork that Apple delivers with music or movies. If you select an audiobook, press Command-I to display the Info window, and then click the Artwork tab, you’ll find that you can’t delete the artwork. You also can’t drag new artwork to the well at the top left of the window. But what you can do is click the Add Artwork button, navigate to a file that you’ve downloaded from a website, and select it. Click Open, and then click OK, and it will be saved with your audiobook. It only seems to be saved in iTunes, and on any iOS device you sync the audiobook too; if you copy the audiobook to another computer, the artwork will revert to its previous low-quality version. Q: Has the option to “upgrade” files disappeared from iTunes, perhaps as a subtle encouragement to use iTunes Match? I’ve got thousands of purchased songs at 128 kbps and would like to get them in iTunes Plus versions. How can I do this? There used to be an option to upgrade files from the older 128 kbps format with DRM to the newer iTunes Plus format, which is 256 kbps without DRM. This cost $0.30 per song. But when iTunes Match came along, Apple got rid of this. Given that iTunes Match only costs $25 a year, it’s probably worth your while to subscribe just for a year and upgrade all your songs; it’s a lot cheaper than if you paid 30 cents each. To do this, you should simply delete the files you have (after backing them up; just in case). When you turn on iTunes Match, you’ll see those songs in your iTunes library with cloud icons next to them; download all the songs you want. You can also download them from your Purchased list. Click the icon in the iTunes toolbar with your name next to it (or Sign In, if you’re not signed in to the iTunes Store). Choose Purchased from this list, click Music, and then Not in My Library. You can download all your purchased tracks from there. Note that some purchased tracks may no longer be available; I’ve found this for a few albums I bought back in the early days of the iTunes Store. Q: A recent OS glitch required me to revert to a clean install of OS X. After restoring my Time Machine backup, I found some songs that iTunes could not locate (and indeed were not on the hard drive). It appears that all artists with names beginning after the letter T weren’t restored (nor previously backed-up). iTunes believes the files are still present in my library, so there is no option to download them from the cloud until I try to play the song and iTunes realizes it can’t find it. Is there any way to get iTunes to verify the location of all of its music files in one go rather than require me to click through thousands of songs to find the ones that are missing? There is indeed. Doug Adams, Chief Scripting Officer of Doug’s AppleScripts for iTunes, has a script called List MIAs, which scours your iTunes library and finds all the tracks that are “missing in action.” Read what Doug says on his website, and also see the other scripts he recommends, such as Super Remove Dead Tracks, which will remove all those tracks so you can re-download them. Q: I used to be able to organize my audiobook series by setting the album title to a series name. However, iTunes 12 favors the author name over the title field. Is there a way to get the organization I want from iTunes 12? One example is the Private series by James Patterson and co-authors. Not all books in the series have the same set of authors. 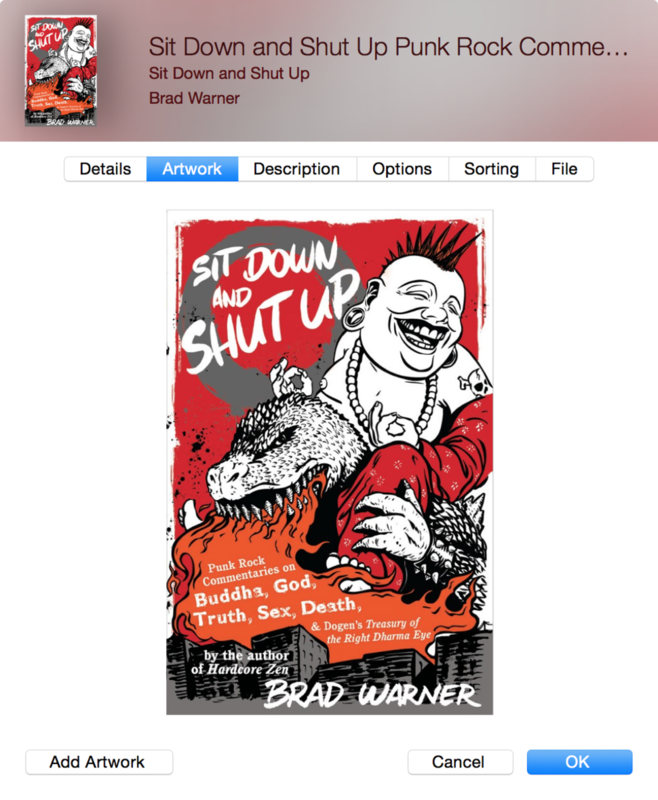 So, if I have iTunes display by Audiobook and sort by title I get separate entries; one for each author. iTunes 12 changed the way files are tagged. Instead of using the same tags for all media kinds, they changed the names of tags for movies, TV shows, audiobooks, etc. As such, you need to do things a bit differently. 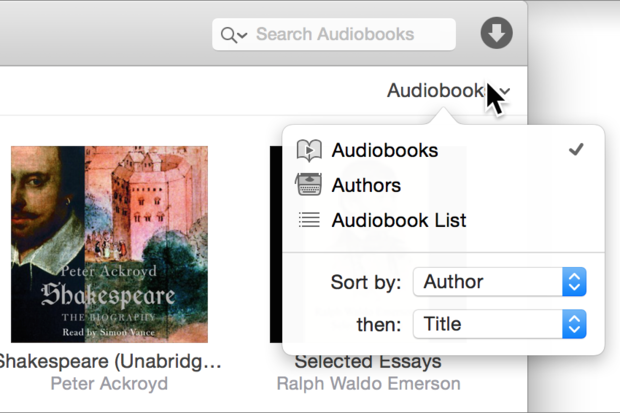 If you choose the Audiobooks view, and then click the View Options menu—the one at the top-right of the iTunes window—you’ll see a number of sort options. You probably want to sort by Author, and then either Title or Year (assuming you’ve entered the year that the books were released in the appropriate tag). 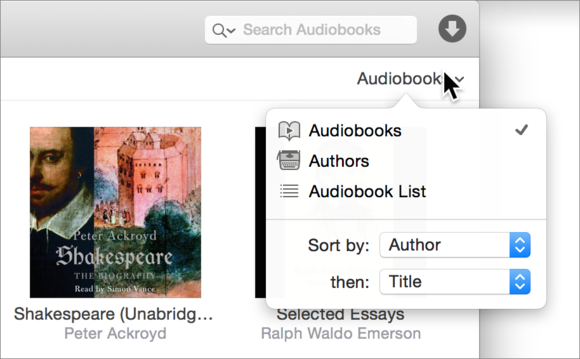 Use the View Options menu to choose how to sort audiobooks. Or, you may want to simply enter James Patterson as the author of all the books, regardless of which other person is listed as co-author. That will keep them all together.